- Real-time protection: Real-time protection notifies you when spyware attempt to run in-memory or install on your PC. - Update Option: The Update Option enables you to get an up-to-date version on a regular basis! 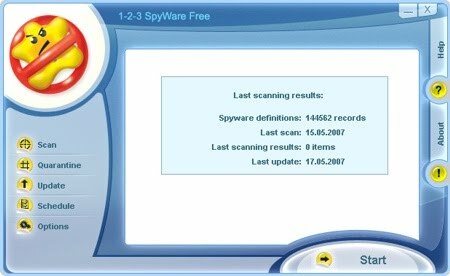 - Undo Option: Use Undo Option to roll back the deleted entries in order to guarantee a safe use of the 1-2-3 Spyware Free. - Schedule: You needn t even manually start 1-2-3 Spyware Free - preset time startup is available. You can choose the following operation modes: System StartUp, Once, Daily or Weekly. Use 1-2-3 Spyware Free on a regular basis and be safe!